Enid Markey seems to have been a favorite leading lady for William S. Hart in 1915 and 1916. 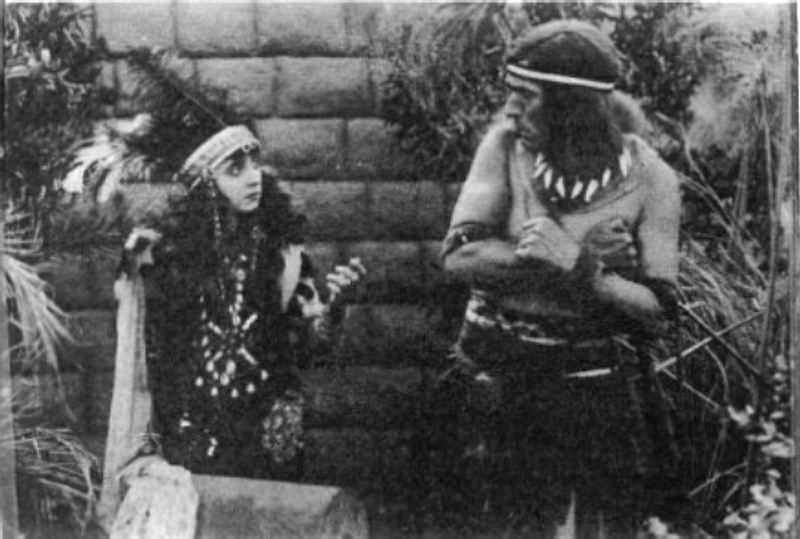 This scene is probably from "The Captive God," a 1916 Thomas Ince (Triangle Film Corp.) 5-reeler directed by Charles Swickard and written by Monte M. Katterjohn. Plot summary, from the Internet Movie Database: A little Spanish boy (Hart) is shipwrecked and cast ashore in Mexico in the sixteenth century. Raised as a god by the Tehuan tribe, who have never before seen a white man, the boy is named Chiapa. At manhood, Chiapa rules the Tehuans. When the priestess Tecolote (Dorothy Dalton), whom he loves, is kidnapped by the Aztec warrior Mexitli (P. Dempsey Tabler), Chiapa follows in hopes of rescuing her. Markey plays Lolomi. Also appearing are Robert McKim as Montezuma; Dorcas Matthews as Maya; Herbert Farjeon as Cacama; Bob Kortman as Tuyos; and William Desmond. Markey did most of her acting from 1914-23, although she continued to make guest appearances in film and television as an elderly woman as late as 1968 ("The Boston Strangler"). Born Feb. 22, 1896 in Dillon, Colo., she died Nov. 15, 1981 at Bay Shore, Long Island, New York.